Blue Skies Blue Skies has produced fresh-cut, ready-to-eat fruit, especially pineapple and mango, since 1997. It harvests, processes and packages them in their country of origin before transporting them to their European retail partners in one to two days. Initially in Ghana, Blue Skies now runs production facilities in several African countries. Farmers and communities benefit far more from the margin earned than they would from simply exporting the raw material to be processed elsewhere. 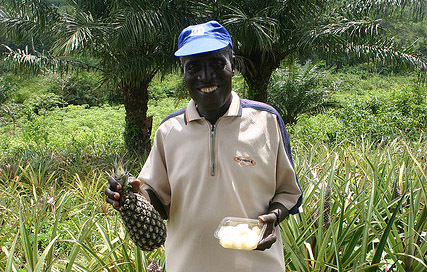 Blue Skies won the coveted Queen’s Award for Sustainable Development in 2008 and again in 2011 for its work and achievements in the developing world. The company also recently received a Private Business Award in recognition of its inclusive business model the ‘Joint Effort Enterprise’.